With the holiday season fast approaching, the ACDA has prepared a list of ways to enjoy the wonderful tradition of gift giving with an extra bonus of helping our nonprofit raise funds for ACDMPV research. 1. Amazon Smile – At smile.amazon.com, you have the exact same prices, selection and convenient shopping experience as Amazon.com, with the added benefit that Amazon will automatically donate 0.5% of the purchase price to the ACDA at no additional cost to you. 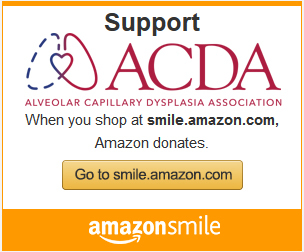 To set up your Amazon Smile account, go to smile.amazon.com, log in with your Amazon password or create an account, go to “Your Account”, select “Alveolar Capillary Dysplasia Association” as your charitable organization and shop! 2. Spreadshirt – Our online store through Spreadshirt ships internationally and includes items for sale featuring the ACDA logo with a designated portion of the sale supporting the ACDA. T-shirts are just the beginning of the products offered…check out our store to see hoodies, baby clothes, buttons, mugs, drinkware, phone cases, tote bags, doggie bandanas, ornaments, etc. The ACDA earns a commission equal to 20% of every product sold! Please click HERE to go to the ACDA Spreadshirt store. 3. Giving Bean – The ACDA is running our fourth annual fundraising drive for our U.S. families through Giving Bean, which is a gourmet coffee roaster providing a variety of freshly roasted coffees, fine tea, gourmet cocoa, chai, and biscotti. All coffee is roasted-to-order (your choice of whole bean or ground) and arrives fresh. Prices are $12 for a standard bag of coffee and tea, comparable to other high quality coffees and teas, with lots of flavors including Sunrise Breakfast Blend (medium roast), Bold Reserve, French Vanilla, Caramel Creme, Chocolate Raspberry, Cinnamon Hazelnut, Pumpkin Spice, Organic Heritage Blend, etc. A Coffee Club is also available for auto-delivery every 4, 6 or 8 weeks of a coffee of your choice. Please click HERE to go directly to the ACDA supporter page and 25% of almost all purchases made through such link will go to the ACDA! 4. Bravelets™ – Bravelets™ sells bracelets for profit in the U.S. with a mission to encourage people to be brave during hard times. 10% of each item purchased through this LINK will be donated to the ACDA. 5. PayPal Giving Fund 1% Donation Match Campaign – When you donate through PayPal Giving Fund during the holidays, PayPal will add 1%. That means that 101% of your donation goes to the ACDA. Make a donation using PayPal starting on November 27, 2018 through December 31, 2018 and they’ll match 1% of every donation of $10 USD or more that you make through the PayPal Giving Fund. Please click HERE to make a donation. 6. The David Ashwell Foundation – If you live in the UK or elsewhere in Europe, there are a number of options available for funding ACDMPV research through The David Ashwell Foundation, including using the Giving Machine while you online shop. Please click HERE and scroll to the bottom to learn more. We give thanks to all of you that have supported our mission to find the cause and cure for ACDMPV. However you celebrate the holiday season, we wish you peace and joy.